Our speaker for the evening is Erin Arnott of Valent Corporation. Valent is the manufacturers of products such as, Safari, Distance and Di Pel. She will discuss the global spread of invasive insects and weeds. Her talk will cover low environmental impact methods of invasive pest control. Erin has spent over 20 years in the Turf and Ornamental Industry. 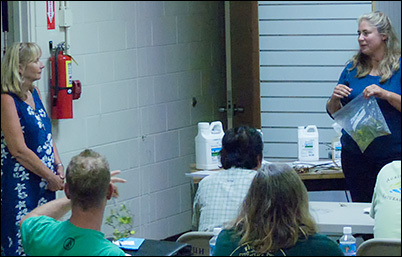 She has extensive knowledge of pest problems both in nursery and landscape situations. Also, during the evening Terry Nutt will give a talk on the Apocynaceae family of plants. This plant family includes familiar plants such as the plumeria, allamanda, oleander, and Be-Still. Plants from this family will be brought as examples and then given away during a raffle at the end of the meeting. The raffle is always fun.